JAMMU, Aug 30: Member Legislative Assembly and former Minister, Chander Parkash Ganga, today kick started the work on Rs. 2.49 crore project envisaging improvement and upgradation of road from National Highway to Village Khadergal under NABARD. 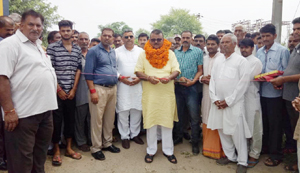 “The construction of this road besides fulfilling the long pending demand of the area would give a big boost to growth and development of the area thus supporting a notable improvement in living standards of the locals”, the MLA asserted while complimenting the people for getting their prolonged demand fulfilled. Ganga, while referring to the urgent need of plantation to combat global warming and environmental degradation, assured the people that a massive plantation drive is being planned along all the roads in the Constituency. He also sought public cooperation in this regard and hoped that they will contribute to the fullest to make this drive a great success. Saying that development is not confined to construction of lanes, drains and roads only but it has more broader contours like ensuring and exploring scope of earning livelihood in their own areas. He also described the role of NGOs and other social organizations as of utmost importance in this regards. He exhorted upon the people to ensure their active participation in effective development schemes in their respective areas as being a responsible citizens they too have a role and moral accountability on this account. Referring to forthcoming Panchayat elections in the State, Ganga appealed the people to value the significance and power of their vote and choose only the right and true representatives which would be a big contribution towards the progress and prosperity of the State and the country as well. He said that in this way they would also be able to teach a lesson to those vested political entities who always befooled and exploited them to satiate their hunger for power. 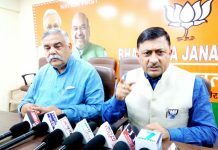 The MLA, while making a scathing attack on previous leaders of the constituency for their failure on all fronts, said that it is quite unfortunate and shameful that they always ignored the aspirations and hopes of the people who evinced trust in these vested interests and voted them for their betterment. Among others present were Tilak Raj Gupta, Tarsem Charak, Raju Sharma, Surinder Sharma, Ravi Sharma, Jagdish Raj, Amit Shrikul, Sahil Sharma, Pawan Sharma, OmKar Sharma, Bodh Raj, Rampal Sharma, Madan Lal and many others.